Jake Locker was a highly regarded college quarterback at the University of Washington. Although his draft stock dropped due to an underwhelming senior season, he was still considered a top option heading into the 2011 NFL Draft. As a first round choice of the Tennessee Titans, Locker immediately caught the attention of collectors. Although veteran Matt Hasselback held the starting spot in 2011, Locker still saw playing time and showed great potential. Many collectors are excited for the future when the team will be turned over to the young quarterback. When that happens, Jake Locker cards and memorabilia are sure to take off. At this point, it is hard to predict the future for Locker. He has looked solid in limited minutes. The Titans also have several offensive pieces in place for him to succeed with young players like Chris Johnson, Kenny Britt and Jared Cook. However, accuracy problems continue to be an issue. Collectors should look to the card companies for Locker's autograph until the supply of authenticated autographs increases. 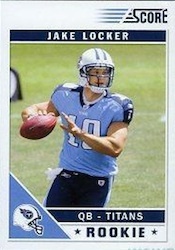 Having been around for several years, the 2011 National Treasures Jake Locker rookie card has a lot pedigree behind it. But it takes a lot more than just pedigree to make a card a player's best. The elegant design also has an over-size patch swatch, numbering to 99 and an on-card autograph. The only slight knock against the card might be the somewhat small signing area. Using the five-point scale, five stars means the top. 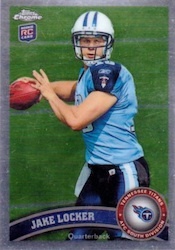 For many collector's, Jake Locker's 2011 Topps Five Star is his best card. Like National Treasures, it has an on-card autograph and a patch swatch. It's also numbered to 75, which is slightly lower than National Treasures. However, the smaller patch makes it stand out a bit less. Still, with so few copies to go around, collectors can still expect to pay handsomely when one pops up. The 2011 Crown Royale Jake Locker rookie card showcases a large jersey swatch as the backdrop for a cutout image of Locker. 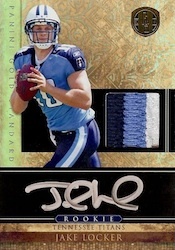 The lower portion of the card houses an on-card autograph and This card should remain a favorite among Jake Locker cards because of the appealing design and low print run. 2011 Panini Gold Standard has emerged as a popular choice for rookie collectors and the Locker card is no exception. The ornate design, limited print run and large signature area make it one of the most desirable Jake Locker cards. The small jersey piece detracts slightly but this card should continue to be high on the list of Locker collectors. Below you will find an example of what Jake Locker's authentic signature looks like. This can be used as a first point of reference for determining the legitimacy of autograph memorabilia, but is not a substitute for having your items authenticated by a well-respected professional autograph authentication company.